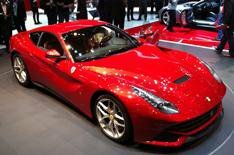 Geneva 2012: Ferrari F12 Berlinetta | What Car? This is the new Ferrari F12 Berlinetta, which has made its public debut at the 2012 Geneva motor show. The all-new F12 Berlinetta is a replacement for the Ferrari 599: despite having a larger engine, its quicker, lighter and emits less CO2. The F12 Berlinetta has a 730bhp version of the 6.3-litre V12 petrol engine thats also used for the FF, whereas the 599 has a 611bhp 6.0-litre unit. Maximum torque is 509lb ft, 80% of which is available from just 2500rpm. A dual-clutch transmission is standard. Ferrari quotes a 0-62mph time of 3.1 seconds and a 0-124mph time of 8.5 seconds. Top speed is over 211mph. CO2 emissions are 350g/km (down from the 599s 415g/km) and average fuel economy is 18.8mpg. Thanks to a high-tech body construction that includes a new spaceframe chassis and 12 different kinds of alloys, the F12 Berlinetta weighs just 1525kg 70kg less than the 599. Two features help to channel air efficiently over the car: theres an aero bridge, which uses the bonnet to generate downforce by pushing air to the sides of the car, where it interacts with the wake from the wheels to decrease drag. There are also vents to the brake cooling ducts that only open at high operating temperatures, which also reduces aerodynamic drag. Adjustable stability control and differentials allow the driver to tweak the way the F12 Berlinetta handles, while carbon-ceramic brakes help it to stop. Ferrari says the F12 Berlinettas interior has been designed around the driver, with all the major controls within easy reach. It describes the dashboard as light and lean, with carbonfibre and aluminium air vents inspired by the aeronautic field. Ferrari hasnt announced pricing for the F12 Berlinetta, but wed expect a rise compared with the 212,066 599, so a figure of around 220,000 is likely. The F12 Berlinetta will go on sale as soon as its unveiled at the Geneva show. First UK customer deliveries are expected in late 2012.